You know when little kids put on a performance and objectively it’s not very good but you wind up enjoying it anyway because the kids are so cute and they’re trying so hard? Well not to sound too condescending, but that’s a little bit how I feel watching Supergirl each week. Despite how much it’s grown since its early days, this is still a series with significant flaws. Yet even as I can see them, those weak spots don’t bother me as much as they would on a show with less charming enthusiasm at its core. I don’t think I’m just making excuses. The ability to create a show that’s consistently likable is in and of itself an impressive feat. It’s just one that’s harder to pin down in a review. It’s easier to point out plot holes and uneven character development than it is to highlight the charming performances, tiny character interactions, and refreshing sense of optimism that make the show go down so easily. But while “Supergirl Lives” has plenty of moments of ephemeral charm, it struggles when it comes to establishing stakes. Supergirl is always going to be a show where the heroes win in the end, but there should at least be a palpable sense of danger along the way. 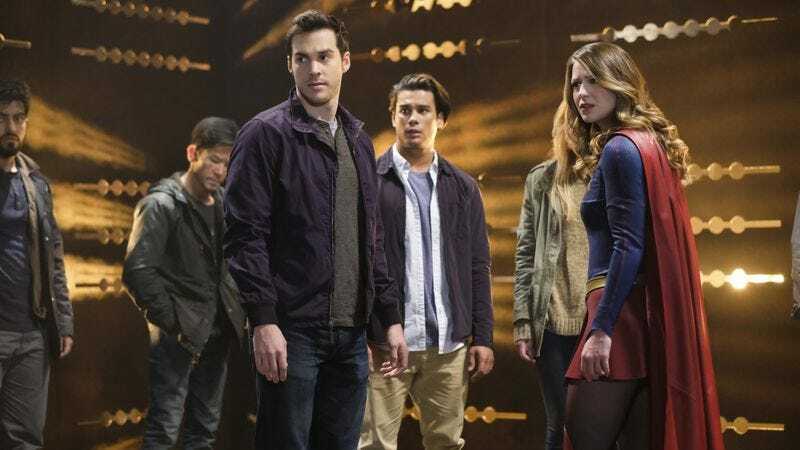 Yet even though Supergirl and Mon-El are both left standard and powerless on a planet halfway across the galaxy, the episode never makes their perilous situation feel like anything more than a minor inconvenience. Part of the problem is that Supergirl has a lot of characters and storylines to serve at the moment, which leaves little room for anything to breathe. 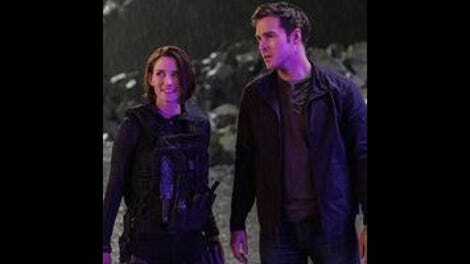 Alex is alternately basking in the glow of her new relationship and figuring out how to factor Maggie into her hectic life; James is still Guardian-ing it up at night and causing tension with Supergirl; Winn is coming to terms with the fact that his new jobs as DEO agent/Guardian tech support are far more dangerous than working a desk job at a media company; Mon-El is trying to find his place on his new home planet; and Kara is trying to find inspiration both as a reporter and as a superhero. Plus we’ve got an intergalactic threat-of-the-week to establish, not to mention Joe, the comic relief alien who seems to have had all but two quick scenes left on the cutting room floor. Individually, all of the storylines are fine (except for the Guardian stuff, but I’ve harped on that long enough), but cramming them all into one episode leaves little room for any of them to establish real weight. The most interesting thing about this episode is just how dramatically it broadens Supergirl’s world. While the first half of the season established the idea that aliens are a thriving minority on Earth, “Supergirl Lives” sets a new precedent wherein Kara and Co. can pretty casually visit other planets too. While we’ve heard about other worlds and even seen them in flashback (not to mention a reference to Superman being “off world” at one point), actually setting an episode on another planet is a pretty big step for the series. After hopping through a Stargate-like portal, Kara and Mon-El wind up on Maaldoria a.k.a. “Slaver’s Moon,” a hub where Roulette (a returning Dichen Lachman) is selling off kidnapped humans as slaves. Though the portal is destroyed at the end of the episode, intergalactic travel is now officially part of the show’s lexicon, which feels like a big deal. The problem is, there’s never any real threat that Kara and Mon-El won’t be able to rescue the stolen humans they’re tracking down. Though they’re both left powerless by Maaldoria’s red sun, neither particularly struggles in combat. There’s a briefly wrenching moment in which Supergirl lets herself be electrocuted as a last ditch effort to help her fellow prisoners. But that one selfless act inspires her fellow captors to fight back in a rebellion that’s achieved with far too little fanfare. Almost as soon as the fight starts, Roulette and her assistant (Difficult People’s James Urbaniak) are behind bars. And although there’s a lot of talk about the evils of human trafficking and the importance of standing up for what you believe in even when you’re powerless, there’s never a sense that any of these people are actually in danger. Our one point-of-view character, Izzy Williams, barely register as anything more than a human platitude deliverer. There’s a similar problem in Kara’s journalism career as well. She’s motivated to follow her heart when a desperate mother comes looking for help finding Izzy, whom the police have deemed a runaway. That leads Kara to both discover the intergalactic trafficking ring and write an 8,000-word story about it, proving to Snapper Carr that following your heart is as valid a tactic as following your head. But, again, there’s a real lack of stakes to this storyline. Kara admits her heart-first method may lead her to some dead ends, but so far that’s not really something we’ve seen. Kara’s such a good journalist (and her journalism so neatly aligns with her superheroing) that there’s no new territory to explore in a side of Supergirl that’s feeling more and more perfunctory. As Supergirl finds her groove again, Alex is alternately getting and losing hers. After enjoying some early relationship bliss, Alex pushes Maggie away in a moment of crisis. That forces her to come to terms with the fact that she has some issues with compartmentalization. She and Maggie work through it, but aside from a truly delightful moment in which Maggie admits she totally figured out the whole “Kara is Supergirl” thing, their fight feels too much like a retread of their rocky courtship. Elsewhere, Mon-El and Winn both grapple with the idea of what it means to be a hero. It’s nice to see Jeremy Jordan asked to do something more this season than just provide comic relief, and this is easily his best performance since “Childish Things.” I have quibbles with the idea that the best way to train a new agent is to throw him into a dangerous intergalactic battle with zero backup, and—like most things in this episode—it wraps up a little too quickly and easily, but Jordan sells the hell out of Winn’s mini arc. Chris Wood similarly does a lot with a little when it comes to the story of Mon-El deciding he wants to be a superhero. The whole thing rests mostly on the awkwardly staged moment in which Mon-El proves willing to take a bullet (or at least a ray gun blast) for Kara. But what it lacks in depth, it makes up for in charm with Wood exuding an insane amount of chemistry with Melissa Benoist. Their interactions are the sort of thing that’s harder to describe in a review yet go a long way towards making the episode engaging. But again, despite the show’s constant reminders that he used to be a bad boy, there’s no real question as to whether Mon-El will step up to the plate when he needs to. Hopefully whatever mystery is clearly hidden in his backstory will switch up his seemingly preordained character arc. “Supergirl Lives” is an episode that’s ultimately at odds with itself. It tells a high-stakes intergalactic story yet uses a mostly light and comedic tone to do so. That leaves it feeling hollow but not entirely unenjoyable to watch. I’d love to see the show find the confidence it had back in its excellent season premiere. But for now, a little Supergirl comfort food isn’t the worst thing in the world. Kevin Smith directed this episode and it’s named after his unproduced Superman script from the 1990s. I quite enjoyed the gag of an off-screen Kara throwing bits of clothing at Mon-El as she changed into her Supergirl outfit, which felt like a Smith touch to me. Also his daughter Harley Quinn Smith plays the missing girl Izzy Williams. Tonight’s episode seems to confirm the theory I’ve seen floating around the comments section that Mon-El is actually the prince of Daxam and not one of the prince’s bodyguards. I’m not sure that fully jibes with the flashback we saw in “Survivors,” but we’ll see. In reference to the fact that an entire bar full of innocent aliens were brutally murdered in the midseason finale, Mon-El mentions that the place was “short staffed” after “the incident.” Okay. Yellow sun grenade: Fun piece of technology or cheap deus ex machina? Mon-El awkwardly pulling Kara’s blanket over himself delighted me far more than it probably should have. Fellow A.V. Club-er Kayla Kumari Upadhyaya wrote a wonderful piece about the ways in which Alex’s coming out story mirrored her own. It’s definitely worth a read.